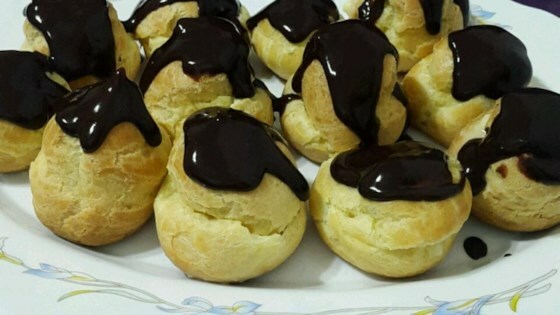 "Cream puffs with a cream cheese filling and chocolate icing." For icing: In small saucepan, melt chocolate and 1 tablespoon butter over low heat. Remove from heat and, with electric mixer, beat in confectioners' sugar and 2 tablespoons hot water. Beat until smooth. Drizzle over filled eclairs. For shells: In medium saucepan bring 1 cup water to a boil, stir in 1/2 cup butter and salt. Stir until melted. Add flour all at once and stir vigorously until mixture forms a ball. Remove from heat and beat in eggs, one at a time, until smooth. Drop by tablespoons onto baking sheet. Bake 15 minutes in the preheated oven, then reduce heat to 375 degrees F (190 degrees C) and bake until golden, 10 to 15 minutes. Cool completely. For filling: In large bowl, beat 1/2 cup of milk, a little at a time, into softened cream cheese, until creamy. Beat in remaining 1 1/2 cups milk and pudding mix. Stir until thick, 1 to 2 minutes. Cut tops off cooled pastry shells and fill. Replace tops. My family went crazy about this recipe. It was delicious. My 8 year old grandson told me that he didn't want me to bake his birthday cake in Feb., he wanted these eclairs. Easy to make too. Taste great. Just a reminder, beat eggs in with electric beaters. Loved the different filling. Made miniature eclairs with this recipe. Everyone loved them.